Also, please tell us how it compares with McClelland's Red Virginias (taste, aroma, etc.). 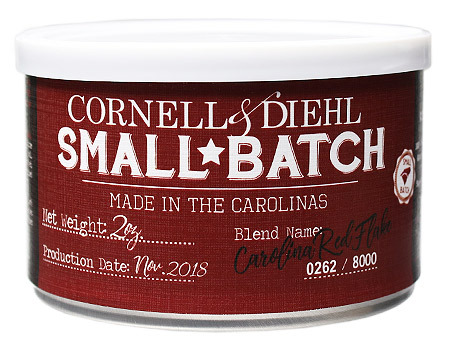 tin description wrote: A blend of the finest North Carolina grown red Virginias, harvested in 2015, our Carolina Red Flake is a tribute to the Old Belt. Plucked straight from Carolina soil, these top-tier Virginias were all grown, thrashed, blended, pressed, and then lovingly sliced and tinned right here in the heart of old tobacco country. Sweet, tangy, and spicy, Carolina Red Flake is both surprisingly straightforward and pleasantly complex: you'll find it's rich, deep, and earthy, with undertones of dried cranberries, orchard grass, and citrus. We're proud of our heritage—and we're particularly proud of this damn near perfect red Virginia flake. Enjoy! B&M in Florence had a tin from C&D a month or two ago and opened it while I was there. My initial reaction was "wow" followed by disappointment that brought it down to a "meh." I do not know how that relates to stars. The broken flake and tin note reminds me of Christmas Cheer, which I think is what they were going for, or something similar. However, several of us who tried it, decided that, like many Red Virginias, it would probably be best if given a year or two to age. Nothing about it was bad, though. Just not as great as the tin note and appearance hyped me up for. That is my one bowl review. ...That is my one bowl review. Keep it up. One day you might be able to review like John-Boy. I have smoked my way through one tin, but that was some little time ago. I liked it enough to order two more tins when I recently got the chance. To the best of my recollection, it was definitely different from pipe to pipe, with some pipes, it seemed to peter out flavor-wise around the middle of the bowl. But with others it was absolutely fantastic all the way down. That is the best of my recollection, it may possibly be erroneous. That's a flat, no star review cuz I haven't tried it. Carolina Red Flake is similar to McClelland's bulk 5100. It's not even close to McCl's 40th Anniversary Red Flake, though some on TobaccoReviews.com think so. Though I say that with a grain of salt. Nothing comes close to 40th. I have not tried 40th, but I dig this stuff, I’ve smoked 2 bowls so far and both were fantastic. Next time I get a chance to sit and do a full review, I’ll do this one. It should age well and who knows what that might do to the blend. I suspect good things. Only problem is hit and miss availability. When will the next "small batch" be released? I was in the mood for heavy English anyway so I had some Smaugweed instead. Who knows and they will probably do something different next time, they rereleased this one because the original batch a year or two ago was recalled for mold issues. I bought 4 tins on eBay though so I’m good for awhile at my smoking pace.